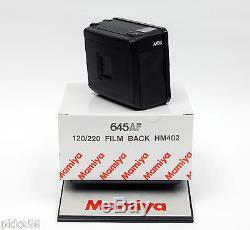 Mamiya 645 AF 120/220 film holder HM402 (fits all 645 AF, AFD, AFD II, AFD III bodies). New with dark slide, cap, instruction and in box. This is the newest/latest HM402 (not the older HM401 film back) optimized to use with the AFD III body that offers continuous shooting at 2 frames per second! The item "Mamiya 645 AFD III / AFD II / AFD / AF 120/220 FILM BACK HM402 2 frames/second" is in sale since Saturday, December 12, 2015. This item is in the category "Cameras & Photo\Film Photography\Film Backs & Holders". The seller is "pkks56" and is located in USA. This item can be shipped worldwide.